3 Suites and 1 private bedroom with baths ensuite have been decorated for the ultimate in sheer pleasure and comfort. 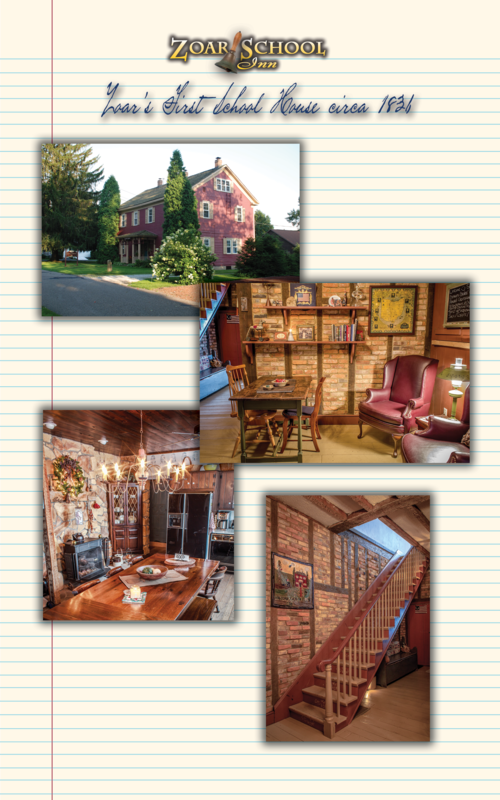 Innkeepers Joe and Gayle invite you to stay at the Zoar School Inn B&B where you're invited to step back in time to enjoy charm of the Historic Village of Zoar. Warm hospitality awaits you. Furnished and decorated with old world style in mind, our private bedroom suites are designed to be your 'home away from home'. And to help you 'stay in touch' we offer Free WiFi throughout the Inn. All rooms have TV w/ dvd players and cable. Originally a one-story 2 room school house built in 1836. Years later an addition complete with rathskeller and a second floor were added. When a new brick school was build in 1868, the 1st. school house become a family residence with the house number 13. A piece of Zoar Village history is now shared with our guests. We observe the European Custom of no shoes in the house. We ask that you bring slippers or indoor shoes for your stay. ​A full and varied 2 course gourmet breakfast served at 9 a.m.
•Check in time after 2 p.m. and check out time is 11 a.m. An approximate arrival time is appreciated. Please arrange for evening check-in. ​ 24 hr. advance reservations only. Please call 216-927-3700 for reservations to initiate your stay.